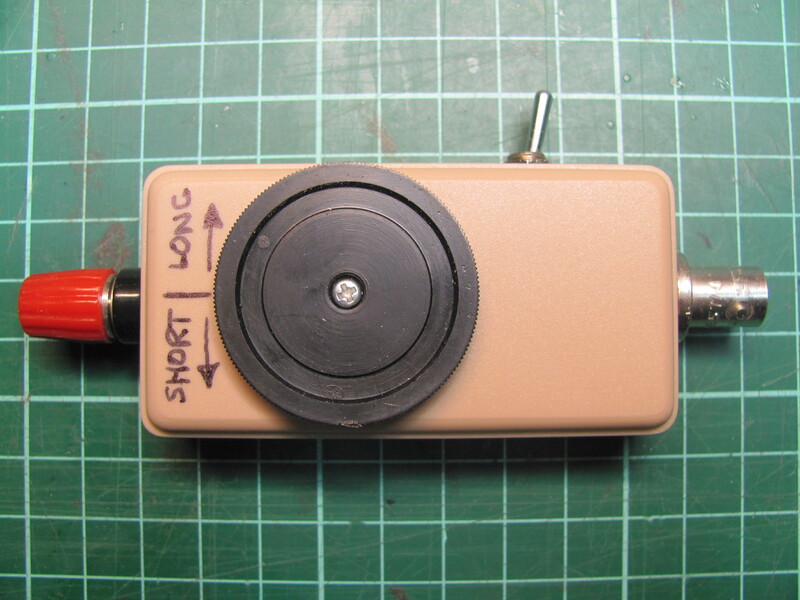 After some success with the original End Fed Half Wave Antenna Tuner on a couple of SOTA activations, it was time to make it a bit smaller and change a couple of things. 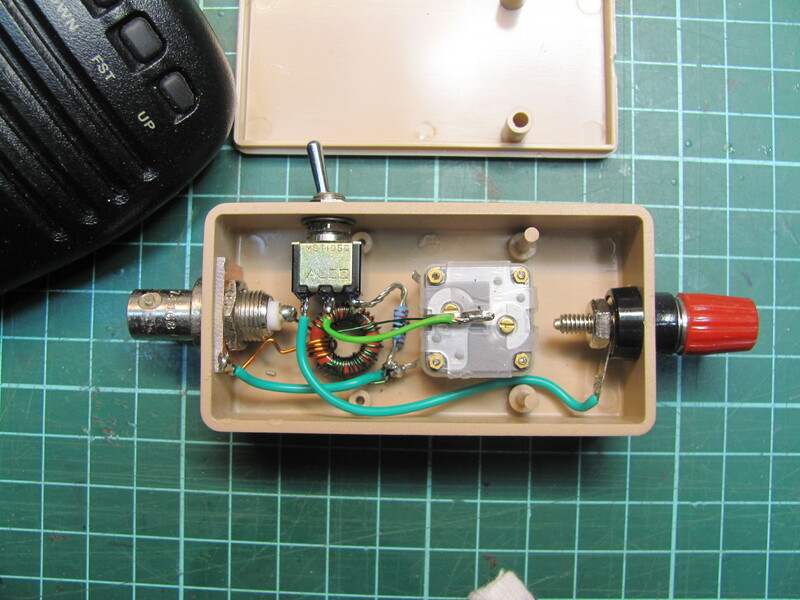 I found that the counterpoise connection was not really needed and the switch that connected the transceiver ground to the counterpoise ground was always left on. So, the switch was eliminated, the counterpoise jack was eliminated and the switch was changed so that it switched in an internal 3300 Ohm dummy load. The load can be switched in to initially match the tuner into the correct impedance and then the switch is changed over to select the antenna. All being well, the tuning should not change by much. If the tuning does change, the direction of the tune will give an indication whether the antenna is too short or too long. The new tuner is a lot more compact at 22mm x 40mm x 78mm. The tuning capacitor is the same one from Jaycar with a max. 160pf. As the tuning control stands off about 5mm from the tuning shaft, the capacitor was recessed about 3mm inside the box with some washers. The core is a T50-2 with 4 turns on the primary and 32 turns on the secondary. The dummy load is simply 3 x 10k resistors in parallel so no more than 2 watts for a few seconds. Update 2013-06-23: I was curious about the losses through the matching unit. To measure, I firstly set the FT817 on 40m to generate an FM signal at 1W and 5w. I measured the output on a Bird power meter at 0.9W and 3.9W. A 3300 5Watt load was connected to the output of the matcher. Across the load, the output voltage was monitored by an oscilloscope. With 0.9W input, a peak voltage of 75V was measured across the load. Squaring the peak voltage and dividing by 2R results in a power measurement of 0.85W. The power was then increased to 3.9W and 140V peak was measured across the load. This works out at 3W. Converting to dB power, the loss at 0.9W is 0.24dB and the loss at 3.9W is 1.1dB. Maybe the core is saturating slightly at 3.9W. The measurement error was probably 5% or so. Anyway, I am happy with the losses through the matcher. I have since made another one using a T106-6 core that can handle higher power. Will post the results soon. Update 2014-04-22> On two occasions now, I have set up on a mountain top and accidentally bumped the dummy load switch. This resulted in some confusion, as signals were way, way down and the matcher still matched. After the first time, the switch toggle was filed down so that it was difficult to flip. It happened a second time on an activation recently, and oddly enough, the penny dropped on both times when attempting a QSO with Matt, VK1MA. Contacts were made with the switch in the dummy load position, but it was a struggle and when the switch was flipped to antenna, sigs went from S1 to say S8. The switch has now been bypassed as it was hardly used in any case.